She loved sunflowers. 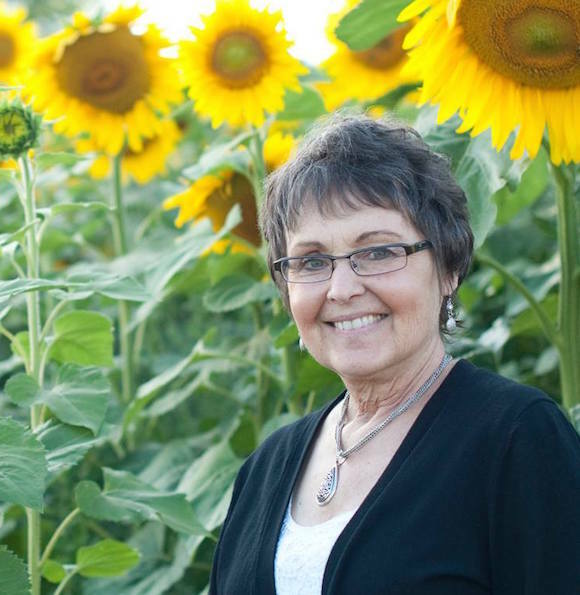 After she died, her family planted thousands in her memory. 4.5 miles of roadside farmland have been transformed into a sea of sunflowers to commemorate the late Babbette Jaquish. Babbette’s family, including husband Don Jaquish, planted the flowers to honor her memory. Babbette passed away from multiple myeloma in November 2014, nine years after initially being diagnosed. Babbette, who family says was loved by everyone who knew her, significantly outlived her doctor’s initial prognosis. Other members of “us” are Babbette’s daughter Jenny White and stepson Jason Jaquish. They both help Don run Babbette’s Seeds of Hope, a charity designed to fuel cancer research and help families in need. 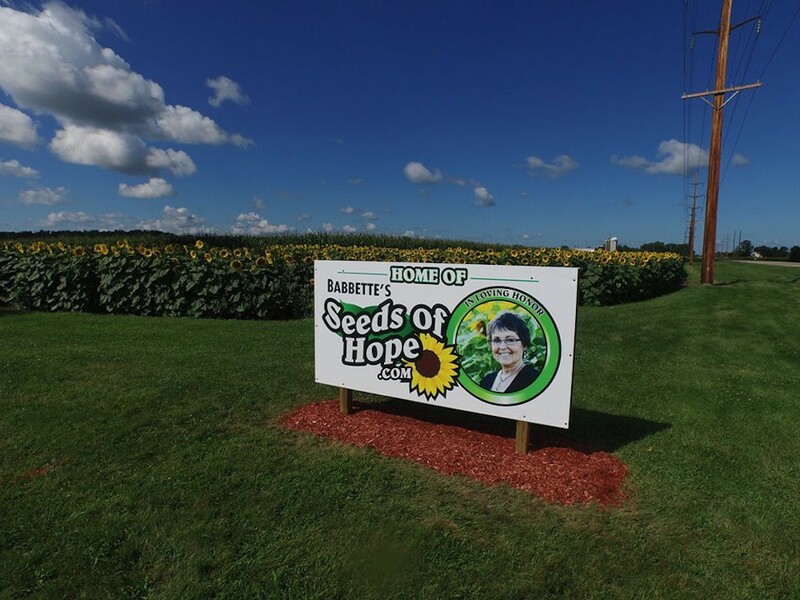 Babbette came up with the idea for Seeds of Hope before passing, suggesting that her family sell sunflower seeds and donate some of the proceeds to cancer research and patient advocacy. 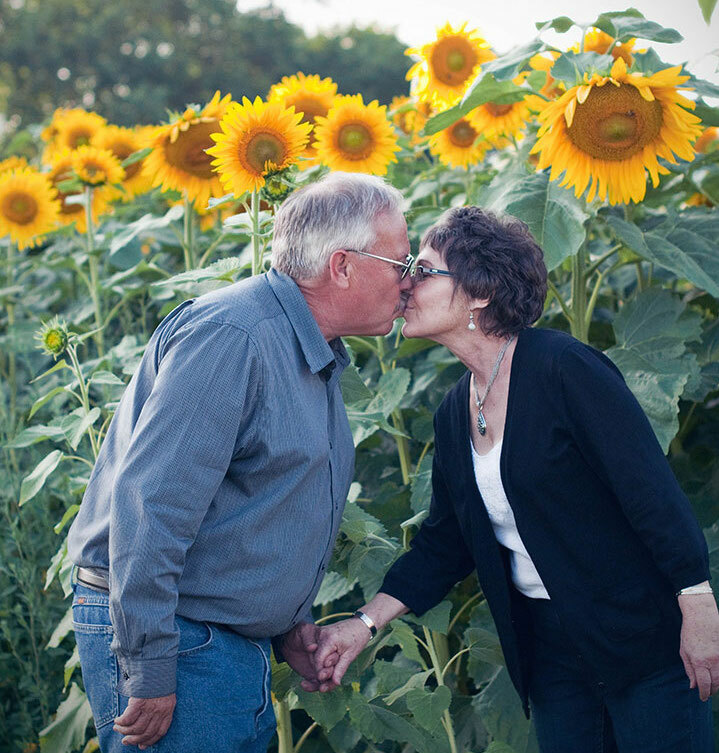 The family had been planting sunflowers for years, Don said. They were her favorite kind of flower. The original plan for Babbette’s Seeds of Hope only involved planting flowers on the Jaquishs’ land, but has since spread to neighbors’ plots as well. Don says he talked to neighbors about using some of their land to plant sunflowers along the side of the highway. According to White, townspeople were more than happy to help Don commemorate Babbette. Babbette herself was involved in farming and sold grain handling equipment back before they got married in 2000. Don was one of her customers, and that’s how the two of them met. Four months to the date after Babbette’s death, Don came across letters that Babbette had written to her loved ones before passing, giving them comforting words and advice. 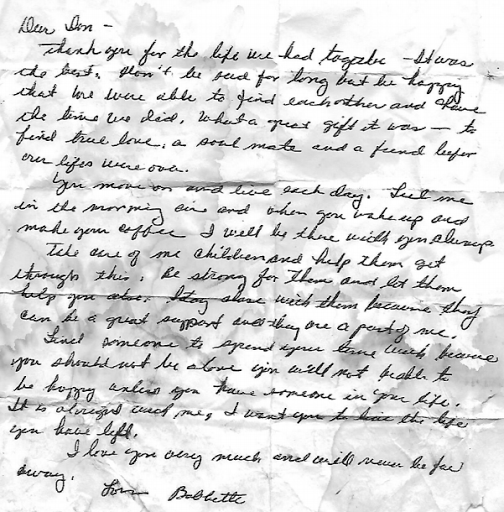 Don shared the letter that Babbette wrote to him. It’s transcribed below the scan. Thank you for the life we had together–it was the best. Don’t be sad for long but be happy we were able to find each other and have the time we did. What a great gift it was–to find true love, a soul mate and a friend before our lives were over. You move on and live each day. Feel me in the morning air and when you wake up and make your coffee I will be there with you always. Take care of my children and help them get through this. Be strong for them and let them help you [sic]. Stay close with them because they can be a great support and they are a part of me. Find someone to spend your time with because you should not be alone. You will not be able to be happy unless you have someone in your life. It is alright with me. I want you to live the life you have left. I love you very much and will never be far away. “It’s very humbling that we have gotten the response and the love and the support from people all over the world,” White said. Don and White were both caregivers for Babbette before she passed and bore witness to Babbette’s original idea to package sunflower seeds and sell them as bird food. White says that Babbette had only intended for the project to be run on a local level, never anticipating the nationwide love and support that the project would receive. 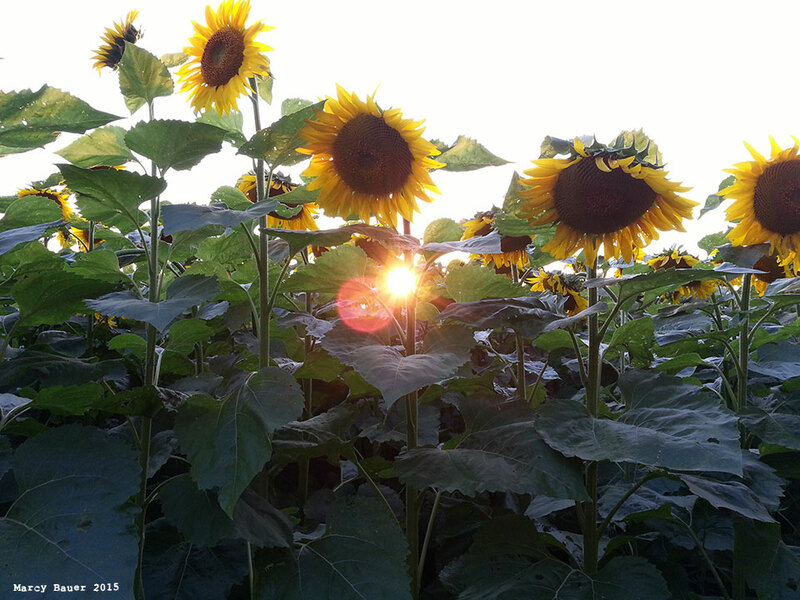 Don’s son Jason is in charge of planting and maintaining the sunflowers. He says that the acres and acres of sunflowers will be ready to have their seeds harvested in September. 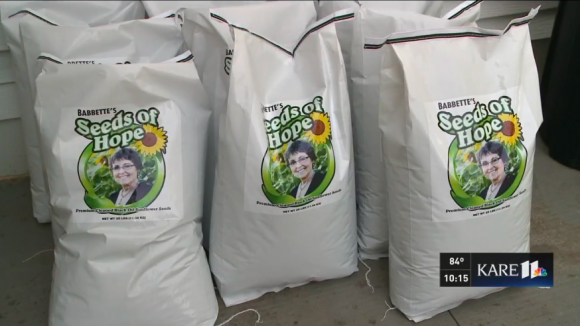 And considering the amount of attention that Seeds of Hope is getting, Seeds of Hope likely won’t have a hard time selling all the bags. “We really didn’t expect this much media hype,” White said. But it’s not hard to see where the hype comes from. The love and affection that Babbette’s family has for her is evident, in their words and in their dedication.